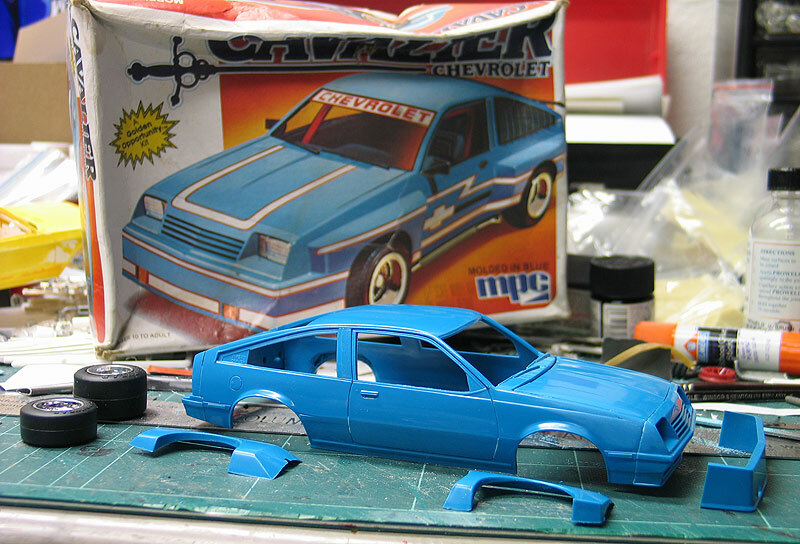 I scored an mint unbuilt '83 MPC Chevy Cavalier kit on ebay a while back. I'd passed over this kit when it was new and I was a teenager. Cavaliers were boring to me back then. But I was feeling a little nostalgic and it was going for cheap. I'm also a sucker for anything unusual so I bought it. It's another kit that I rarely ever see anybody build which is reason enough for me to build one. Plus I grew up as a IMSA road racing fan during the '80's. 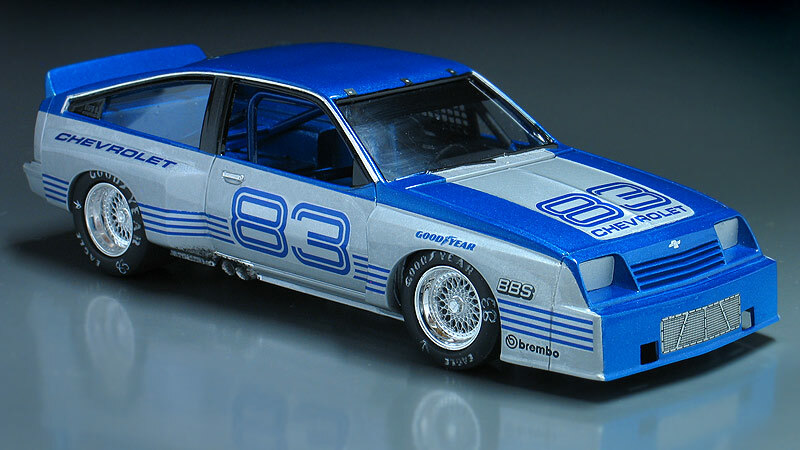 The MPC kit came with a '80's style wide body kit and I thought it would make a neat vintage IMSA road racer. 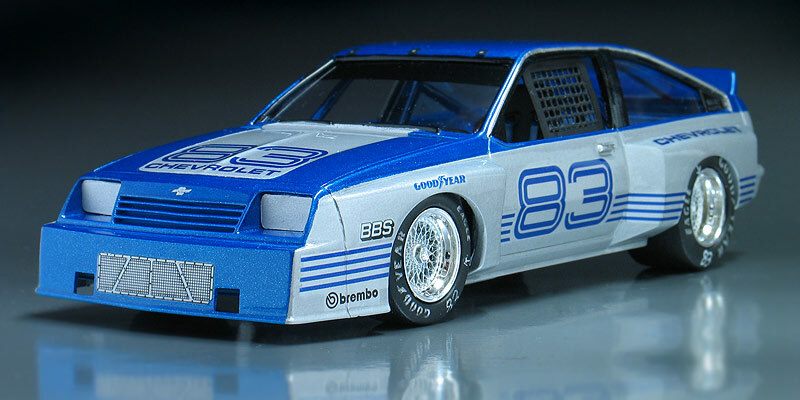 After doing some research I discovered Chevrolet never actually raced a Cavalier in IMSA, so I decided to make my little Chevy a "what if" fantasy car. 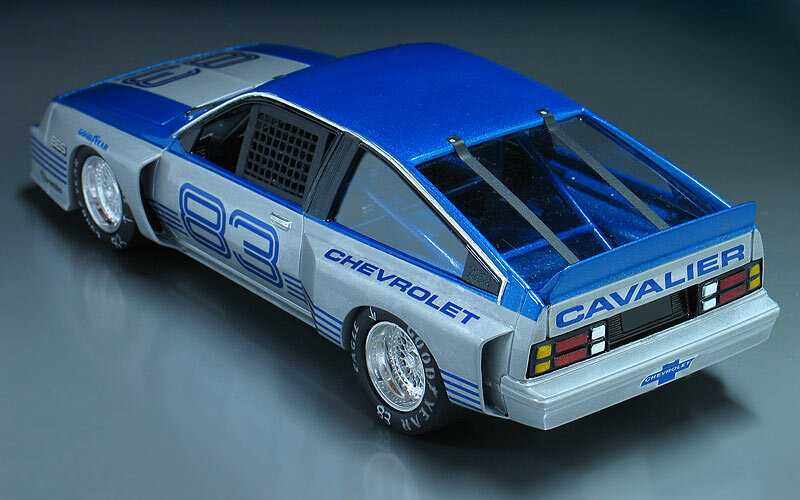 So, here's what I imagine a factory sponsored Chevy would have looked like if they would have raced one back in '83. Below you can see the body before I added the pontoon style flared fenders. First, I removed the body side door moldings. Then I added the basic five piece body kit included in the MPC kit but did make a couple of modifications. I didn't like the boxy notch shape in the front fenders next to the headlights, so filled in this transistion with putty and blended it to the front facia for a more aerodynamic look. I also ground open the back end of the flares with a dremel tool to allow air flow to escape, which is more common for race cars using this type of body work. The front wheel openings was also slightly radiused for more wheel clearance. 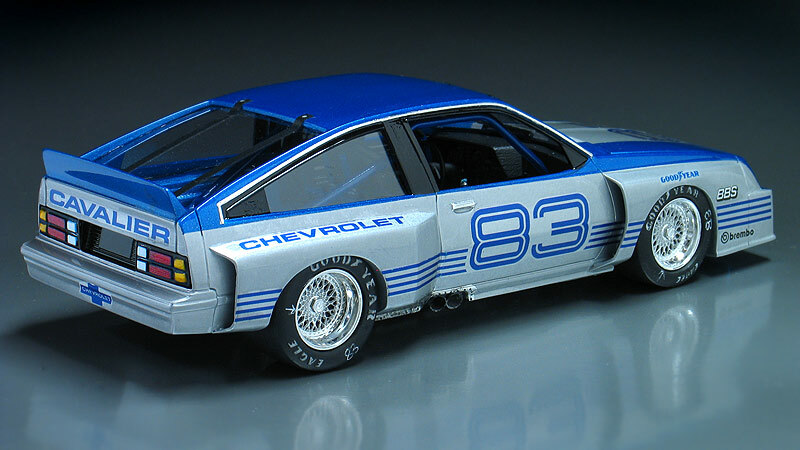 Lastly, I also added a rear spoiler made from a cut-down 1/20th scale Monogram Camaro rear spoiler. For wheels and tires, I dug through my parts box and found a set of '80's style BBS wheels from a Monogram 3n1 '78 Camaro kit. The wheels were sanded from the back side to open up the molded closed spokes. For tires I found the set of big and little Goodyear slicks from a '80's vintage AMT/Ertl March Indy car had the right look to them for my project. Since I thought I might want to use these again on other projects I made a mold and cast a duplicate set in resin. 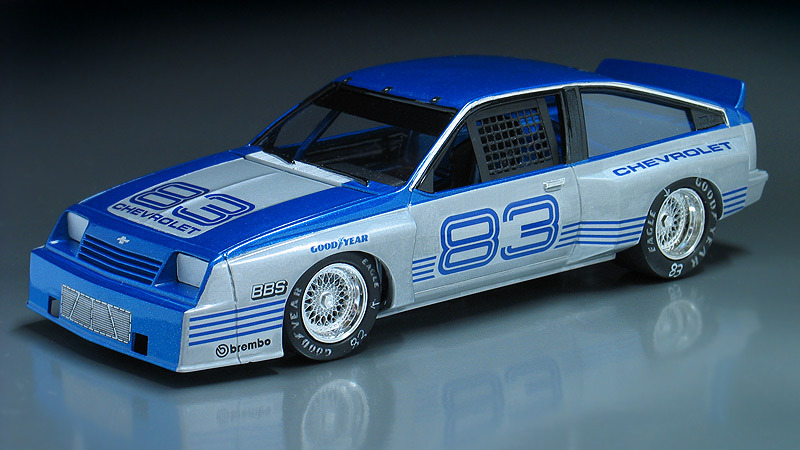 Lasty, I added tire lettering, race markings and then the tires were lightly drybrushed to look race weathered. To replicate a gutted race interior I had to make some drastic changes to the kit parts. The interior comes with a molded in rear seat. First, I cut away the rear seat section and replaced it with a sheet metal floor section made from plastic sheet. The kit comes with a very simplistic roll rage. I used that as a starting point and then added cross bracing, door bars and extra diaganol bracing. The front stock seat buckets were also swapped with a race bucket from my parts box. Lastly, I made a window net from scratch using some cross stitch webbing. Another change I made was to the glass. Unfortunately, the MPC comes with a dark tinted window piece which would not have been appropriate for a race car, so I had to make all new glass cut from clear plastic sheet. I also added safety straps on the windows made from black tape. 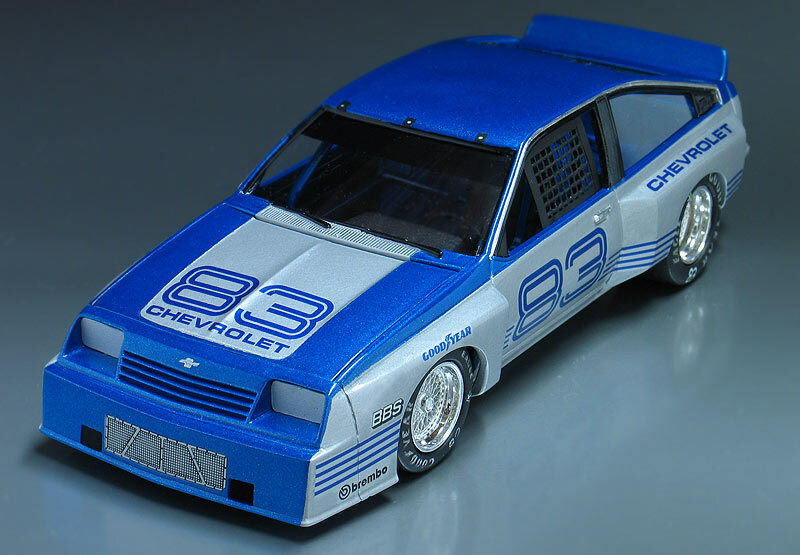 Since this was a fantasy build, I designed a fictional factory paint scheme for my Chevrolet using thin "laser" stripes that were all the rage back in the '80's. I made my own decals and printed them on clear inkjet decal paper. A benefit to using clear decal paper is that when you use clear decals over a silver base the transulcent inks appear metallic once applied to the car. The other small sponsor decals were taken from various left over sheets from my parts box. I also incorporated a grill decal from a Slixx NASCAR goodies sheet to help visually break up the space on the big front air dam. I also made headlight covers from sheet styrene to replace the stock headlights. Lastly, I notched the passenger side rocker panel for an exhaust outlet and made a set of dual exhaust pipes from aluminum tube. After final assembly, the exhaust was drybrushed weathered to look more realistic. 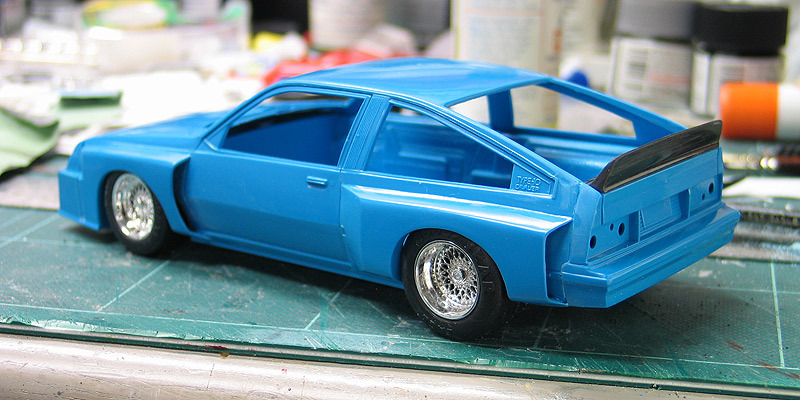 The rest of model was built "curbside" style so I doesn't have feature any engine or chassis detail.